Look how filthy those socks are! To say we woke up cold would be a huge understatement…. We were freezing. The alarm sounded at 5am but there was no chance we were going to get out of our sleeping bags then, it wasn’t fully light and the only movement possible was snoozing the alarm and burrowing ourselves deeper into our bags to escape the freezing damp air. Our sleeping bags are awful and every morning and night I regret not bringing our decent warm down bags that we both own. We worried that we would ruin them, or that they would be too warm but not bringing them was the worst gear choice we made, the cheaper synthetic version is just terrible in every way. At about 5.45 we made the decision to get up and get moving to warm ourselves, the tent was surrounded by a dense mist and our gear and the ground around us was covered in a thick icy frost. We had no coffee left and the previous night we had packed up as much of our stuff as possible in order to get moving early, I contemplated making some mugs of warm water but we opted for wearing just about every item of clothes we possess. 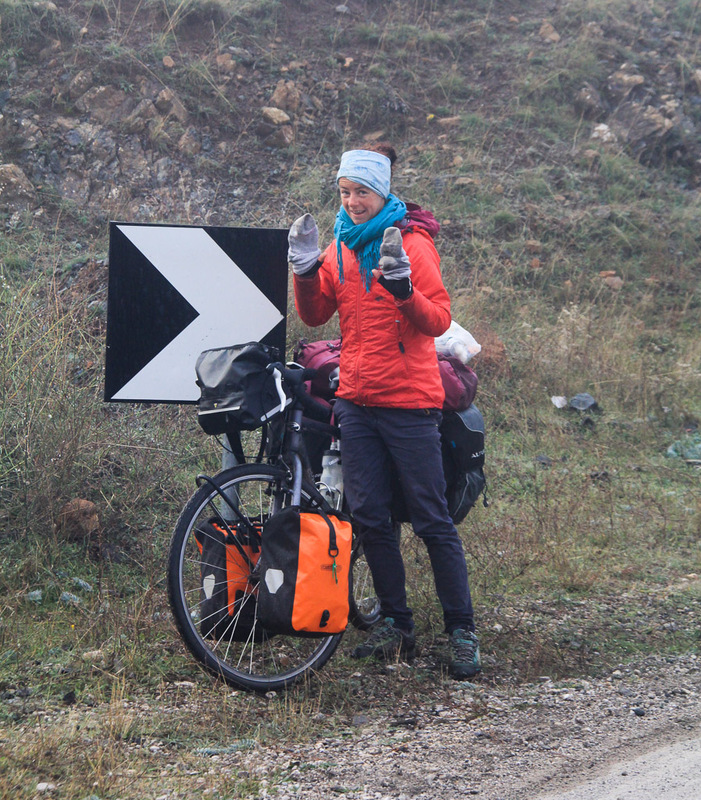 We were making the effort to leave early in order to cycle to the town of Ohrid in Macedonia where we could stay somewhere with such luxuries as a shower and have a day of rest. We were not sure of the exact distance, approximately 90km but with some big hills and potentially bad roads it could take a long time. After the clocks changed nightfall is at 4.45 so the amount of daylight is quite limited. After repeatedly bitching about how cold it was to each other we had everything packed away and started peddling into the mist just before 6.30. At 1100 meters we had a short climb before a long 300 meter descent. Our fingerless gloves offered no protection for our fingers which were sandwiched between the frozen brake leavers and the icy damp air blasting past. It wasn’t long before we stopped to pull socks over our hands to offer some kind of protection before carrying on with our downhill freewheeling. We really needed some coffee to wake up and get warm, we thought we were close to a town marked on the map called Mollaj so didn’t think it was going to be far. After descending the hill we were in an area with a lot more agricultural activity, numerous small-scale apple, olive and orange groves all showing the signs of autumn. The only traffic on the road were Chinese tractors of various guises. Rusting ancient leftovers from the close communist relationship the two countries shared in the 70s, belching black smoke with Chinese characters stamped on the remains of the hoods covering the noisy engines chugged alone slowly. Slightly less slow were the newer Chinese engines on wheels, basic and functional with no added extras, literally just an engine, wheels, basic seat and handlebars. Chinese companies have really captured the market on affordable farm machinery and you see them all over the world. At 14km the village was further than we thought meaning we had at least 100km to cycle. Set off the road we were on, we turned to try to find the centre and any signs of a café. Cafes are common here, coffee drinking is almost a national pastime so it was likely there was to be one. The town was clearly poor, there were few signs of cars and few shops. The only buildings were clearly from times past, abandoned government buildings, small ramshackle houses and squat tower blocks made of a concrete frame filled with misshapen bare bricks. We found a small dark café at the crossroads that formed the middle of the town and sat outside with our coffee. It was busy with men of various ages waiting presumably for day labour on the various small farms. Trucks, tractors and small vans would arrive creating a short lived buzz, but there was clearly an oversupply of people compared to demand. Life is clearly hard here, work is in short supply and it was sad to see a most likely daily cycle of people trying and unable to make a days wage. Some had a small lunch prepared and tied to their belts, but most didn’t – whether this was because they were not expecting to work or they couldn’t afford it is uncertain. The GDP of Albania is small despite the flash cars and new tower blocks at the coast. We were surprised when we looked it up to see it ranked 126th in the world, in between Namibia and Burkina Faso, well below the global average. With a population of 3 million (compared to Irelands 4.5 million) it has just 5% of its economic output. Invigorated by caffeine we headed back onto the main road, the sun was starting to break through the mist which took the chill out of the air. 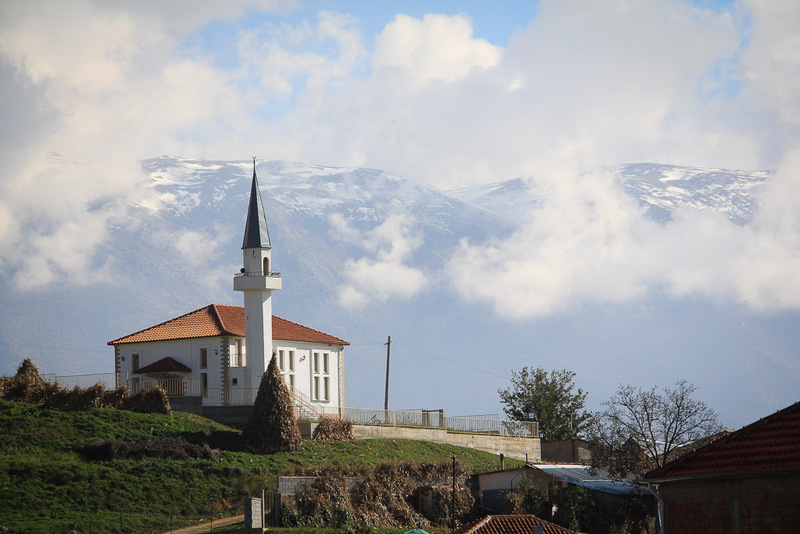 Within a short distance we had to pass through Albania’s 6th largest city, Korce – home to a large Greek minority and considered by some to be Albania’s cultural capital. 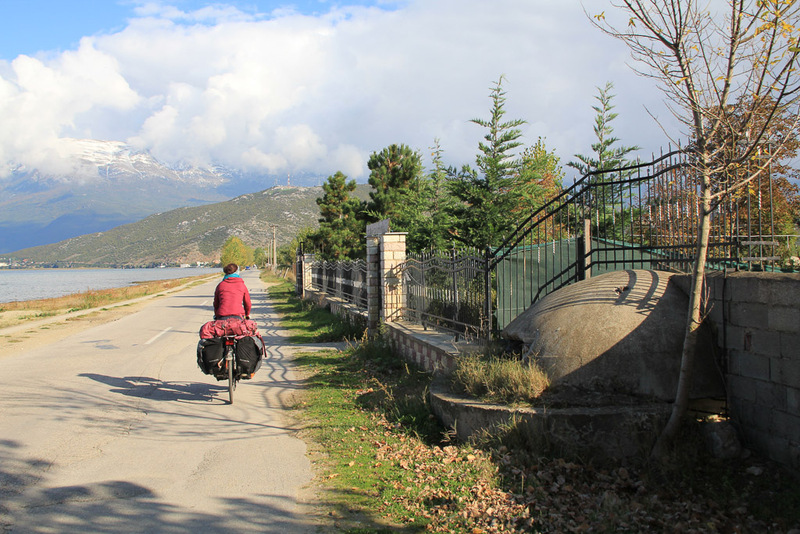 We passed through and it was bustling, cycling through was not easy as it is undergoing the intense and manic road resurfacing that seems to be occurring in every Albanian town and city we passed through. Most of the central roads had been ripped up so there were huge piles of materials, potholes and erratic driving all around us. An almost grand theft auto style of riding was needed to circumnavigate the numerous objects that crossed our path; minibuses, trucks, buses, other cyclists and pedestrians all seeming to be aiming at us. We stopped for burek, glad to see a meat one in a bakery window in all its greasy pastry glory followed by another coffee, this one complete with a small mountain of whipped cream on top. They are so difficult to remove people have to build around them! Finding the beach bunker meant we has all except the bunker with a business in… there are supposed to be quite a few burger bars, bars or even small places to stay but we didn’t find any. 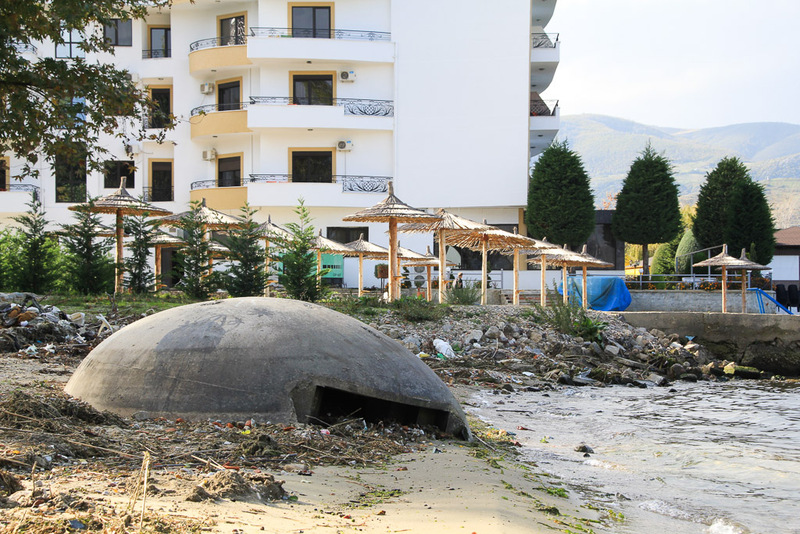 The route around the coast was lined with bunkers, every 50 meters there was a small one man bunker facing out towards the lake and the former Yugoslavia still there, still causing an indestructible annoyance to whoever now owns the land. Slightly delayed we cycled towards Macedonia, the border crossing was extremely quiet and uneventful. The Albanian border guard spent the whole process yapping on the phone while entering our details into her computer and stamping us out, the Macedonian guard was almost asleep in his hut, not another person in sight anywhere. With no stamp again entering a country (the lack of stamps in the Balkans has been disappointing!) 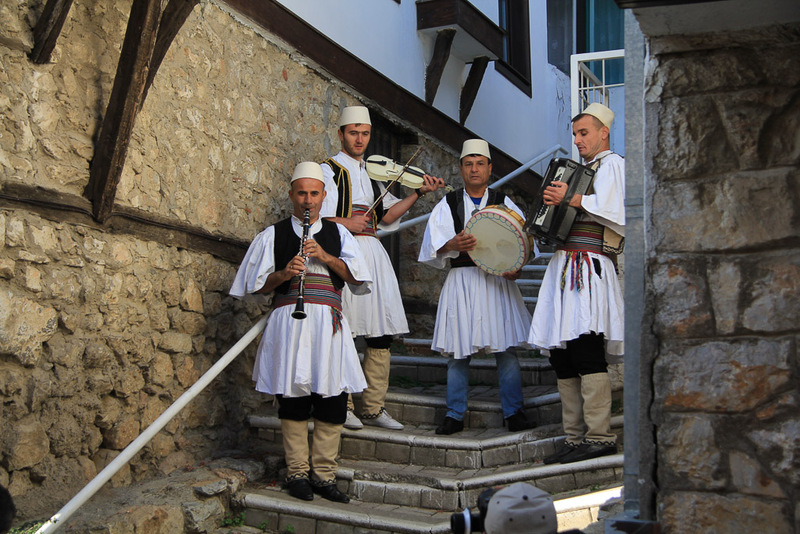 we cycled along deserted roads, through small hillside villages where everything was closed. 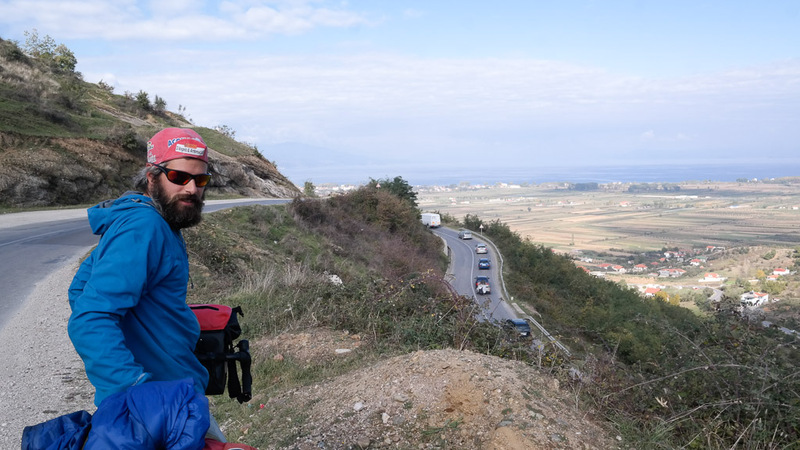 We had about two hours to cover the remaining 30km along an undulating road with one large climb to reach Ohrid town before dark so we had to press on and keep a fast pace. The road was largely good quality and we were cycling fast despite already covering over 70km in the day, the descents were very steep and Sheena broke her Sheena land bike speed record clocking in at 55.8 km/ph. 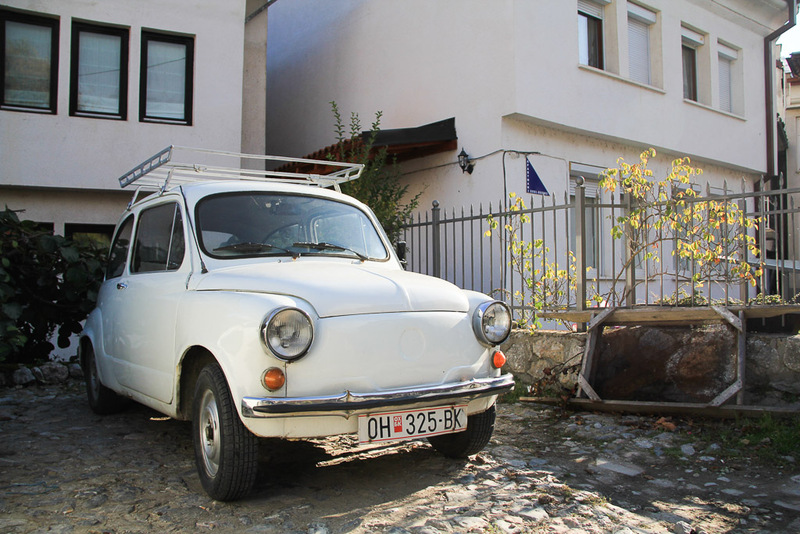 Macedonia… back to amazing old cars! Sheena was cycling close to me, very close and we were moving fast. With my head down I didn’t see the huge pothole rapidly approaching in front of me, when I glanced up and saw it I had barely a second to narrowly miss it, Sheena behind me had no time to avoid it and completely unexpectedly hit it at full speed. I shouted a warning but when I turned around it was too late, in slow motion I saw her panniers fly up into the air sending her bike into an uncontrollable wobble. Despite pulling on her brakes the uncontrolled momentum was too much and she crashed into an embankment at the side of the road, fortunately she has slowed down a lot and fell to the right and not the left. Luckily, despite being shocked, bruised and frustrated she was ok. An older man who seemed to be doing some gardening saw the whole incident and was clearly concerned watching for 30 seconds or so before heading into his house to fetch a drink and his daughter who could speak English. 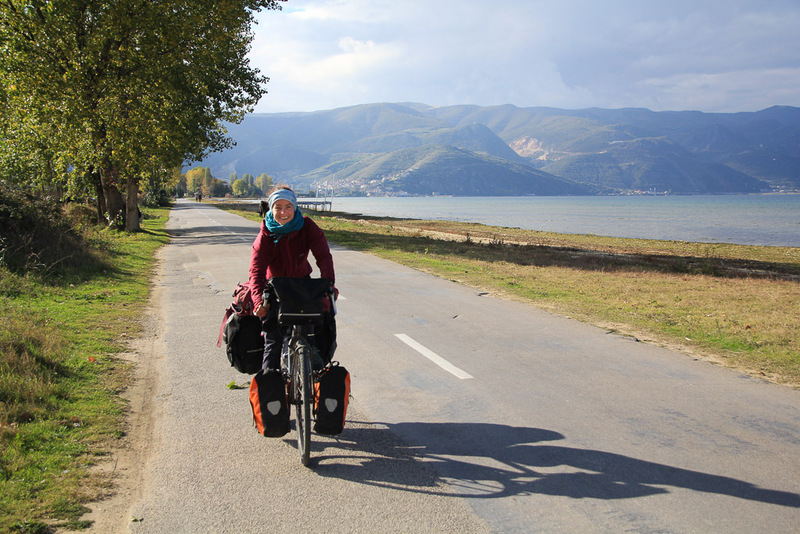 After sitting at the side of the road for five minutes Sheena bravely got back on her bike and we continued at a slower pace to complete the final 10km into Ohrid. 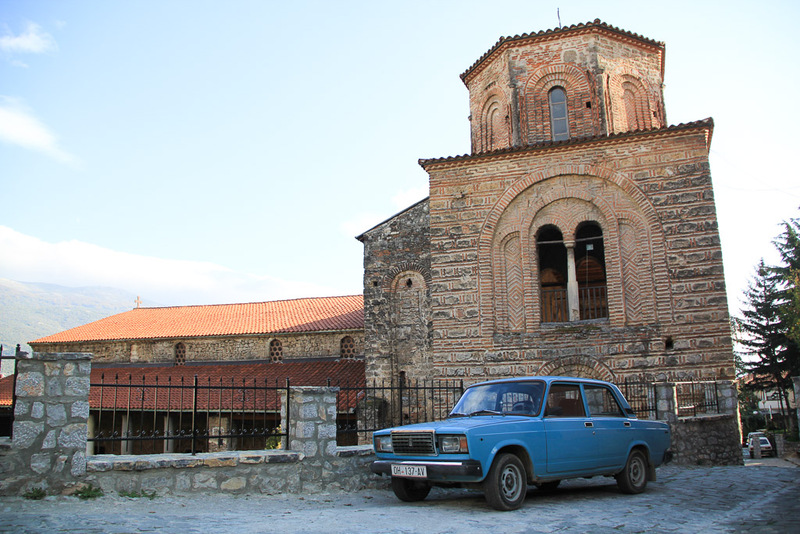 The church where the cyrillic script was invented/planned out. As with many places in Eastern Europe, people tend to hang about areas of public transport in order to offer private accommodation to people who arrive. We had nothing booked and intended to seek out an apartment for a day or two of rest so had to find the said touts to find a place to stay. 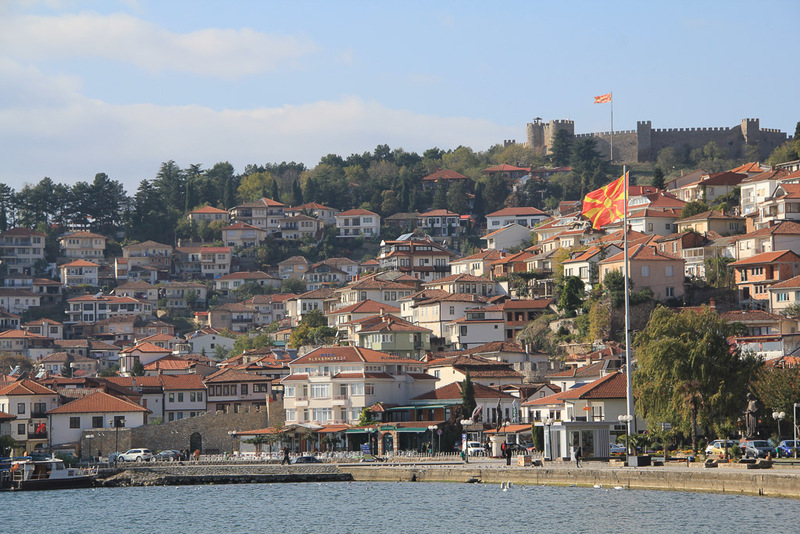 Ohrid was much bigger than we expected and we were not sure where to head, it was just about dark and we were absolutely exhausted and hungry. We were not sure where the bus station was so headed to a small square which we hoped was the centre – luckily we were approached almost immediately, someone who obviously collects a commission asked if we were looking for a place to stay and had a phone with many pictures. It is well out of peak season her so we had our pick and could bargain hard, for just 15 euros per night we have an amazing apartment in the old town looking out over the lake. Internet, hot water, double bed complete with duvets and a balcony to sit on and reflect on an amazing week we have had roughing it in the countryside seems like complete luxury. Life is good!